Effects of three intervention strategies on circumcision uptake (MMC=medical male circumcision). Figure provided by Dr. Ruanne Barnabas. While the last thirty years have seen many improvements in HIV treatment and prevention, implementation of measures that have been shown to be highly efficacious is still behind targets fixed by the Joint United Nation Program on HIV and AIDS (UNAIDS). In particular, male circumcision can reduce HIV acquisition by 60%, and use of antiretroviral therapy (ART) almost abolishes the risk of transmission. Nevertheless, only 30% of the male population has undertaken circumcision and only 40% of HIV-positive people are virally suppressed. It is therefore imperative to identify the gaps between research and implementation where subjects are lost in the linkage to care and prevention. To address this issue, a multisite, randomized controlled trial was run in South Africa and Uganda to identify specific ways to increase ART initiation upon HIV diagnosis or circumcision uptake for HIV prevention. Results of this trial, conducted by a group of investigators including Fred Hutch Dr. Ruanne Barnabas, were published in May in The Lancet HIV. The trial focused on two intervention strategies in the HIV-positive arm to be compared with the standard clinical referral: 1) a counselor clinic facilitation, where a lay counselor explained the steps of engagement in care and benefits of ART, or a 2) lay counselor follow-up, where participants received at home visits at months 1, 3, and 6, from counselors responding questions about HIV care and provided information about clinics and ART. For each of these groups, the participants were further randomized to receive point of care CD4 T cell counts or referral to CD4 testing. Interestingly, home visits resulted in an increase, although modest, of ART uptake, whereas clinic facilitation failed to modify ART uptake; both interventions increased the visits to the HIV facility. So, although implementation of the follow up intervention with home visits might be complicated especially in a rural context, it increased the frequency of HIV-positive subjects that gain access to care. Overall though, only 50% of tested subjects achieved viral suppression at the 9-month follow-up, with no difference between groups. The main problem identified was at the ART clinic, where more than half of patients that were ART eligible were excluded from treatment. Decentralized HIV testing and ART delivery service might overcome the identified bottleneck of overburdened clinics. In the HIV-negative group, three interventions were compared: a standard of care clinical referral, mobile phone messages This could be the best decision you make-act now! followed by phone calls, and home visits 1 and 2 months after testing. 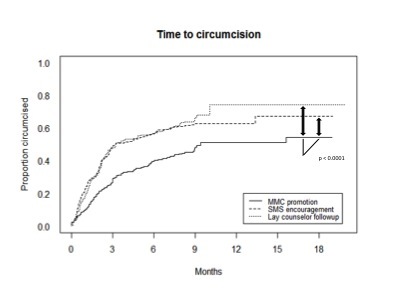 Although the numbers of subjects that visited a circumcision facility were comparable in the three groups, both interventions (mobile messages and follow-up visits) resulted in an increased circumcision rate at month 3 after testing. Therefore, reminding, encouraging and explaining subjects the benefits of circumcision increased its uptake. The study points to the need of improvement of community based centers and training of lay people that can instruct HIV-positive subjects on the importance of ART uptake and HIV-negative subjects on male circumcision to achieve the final goal of HIV prevention and care. Finally, commitment of the community might be a powerful tool in the fight against HIV. Dr. Barnabas is already looking at strategies for further improvements: "We found that community-based HIV testing and linkage strategies, such as SMS reminders or lay-counselor visits, increased linkage for ART initiation and male circumcision. Key next steps for community-based HIV treatment and prevention strategies include integration with efficient clinical services, and additional strategies to address bottlenecks in care that are barriers to ART delivery." The study was supported by the National Institute of Allergy and Infectious Disease, National Institutes of Health. Barnabas RV,van Rooyen H,Tumwesigye E,Brantley J,Baeten JM,van Heerden A,Turyamureeba B,Joseph P,Krows M,Thomas KK,Schaafsma TT,Hughes JP,Celum C. 2016. Uptake of antiretroviral therapy and male circumcision after community-based HIV testing and strategies for linkage to care versus standard clinic referral: a multisite, open-label, randomised controlled trial in South Africa and Uganda. Lancet HIV, 3(5), e212-20.